This has been a week of learning through projects and a small amount of book work. Even last year that would have bothered me terribly. But after a change in our entire school style to accommodate Amber's chronic illness, I'm actually mentally okay with this week's progress. Amber still thinks she needs to be doing more book work, and can't handle when her work isn't perfect. We are working on helping her adjust to the new style and expectations. Monday was mostly a sick day because Amber had a food reaction to a small of amount of garlic eaten last week. We ended up doing an intestinal cleanse Sunday. Amber's brain was just so slow on Monday. She slept quite late and couldn't get it in gear all day. That was ok. We did some grammar, a little German, and the rest was project work. Oh, and errands (with some fun shopping too). The child LOVES My Little Pony. See how many MLP items you can spot this week. LOL. (LEFT) MLP top, pants and socks. This was her co-op day outfit this week. (RIGHT-TOP) Playing games with Dad... in her MLP hat. (RIGHT-BOTTOM) Dinner at our favorite McAlister's after co-op. One exhausted, but happy child. Wednesday was another non-school day. 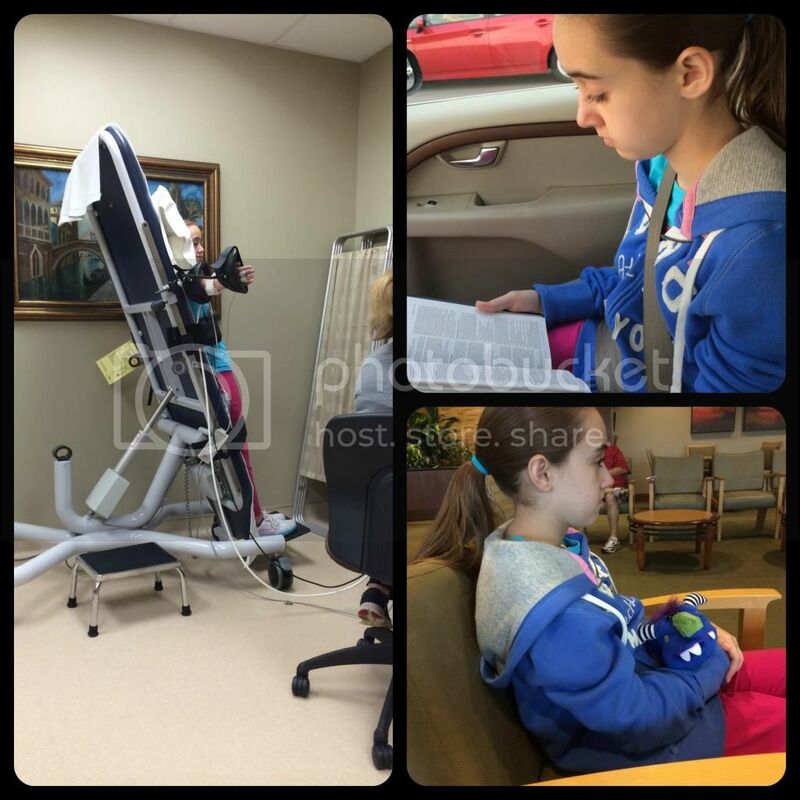 Amber had her tilt table test which left her not quite as sick as expected, but also didn't go as anticipated. In actuality there was a set of smaller tests scheduled to go with the tilt test. The smaller respiratory tests were a little difficult, but overall were some of the simplest medical tests Amber has completed. When it came time to do the tilt portion, it was explained that while adults are usual put at a 70 degree angle for 45 minutes, since Amber is a child she would only be in that position 25 minutes. The wonderfully kind technician requested that Amber let her know of any symptoms and tell us how she felt the whole time. If she felt like she couldn't continue the test would stop, but she really needed to go the full time, if possible. Any guesses on how long she lasted? Amber was not verbal during most of the test. She answered questions but did not offer any feedback spontaneously. At the 7 minute mark the technician abruptly told us it was complete. Amber's vitals indicated she was about to lose consciousness. Her heart rate, which had elevated 40 points immediately after Amber was raised, started soaring even higher her and blood pressure was bottoming out. The graph from the data stream was quite startling. Even though it was a short test, they do have quite enough data. Her POTS was already diagnosed, but if there was any question about it the test confirmed she has severe POTS (dysautonomia). The next step is to get the blood test for the rare autoimmune disease that is a possible cause of Amber's POTS. (LEFT) During her 7 minutes tilted. (TOP-RIGHT) Reading her Bible study assignment for the next day. Appropriate for on her way to the tilt test. (BOTTOM-RIGHT) Waiting for the test with her beloved "Spooky". He's an older Halloween Webkinz. 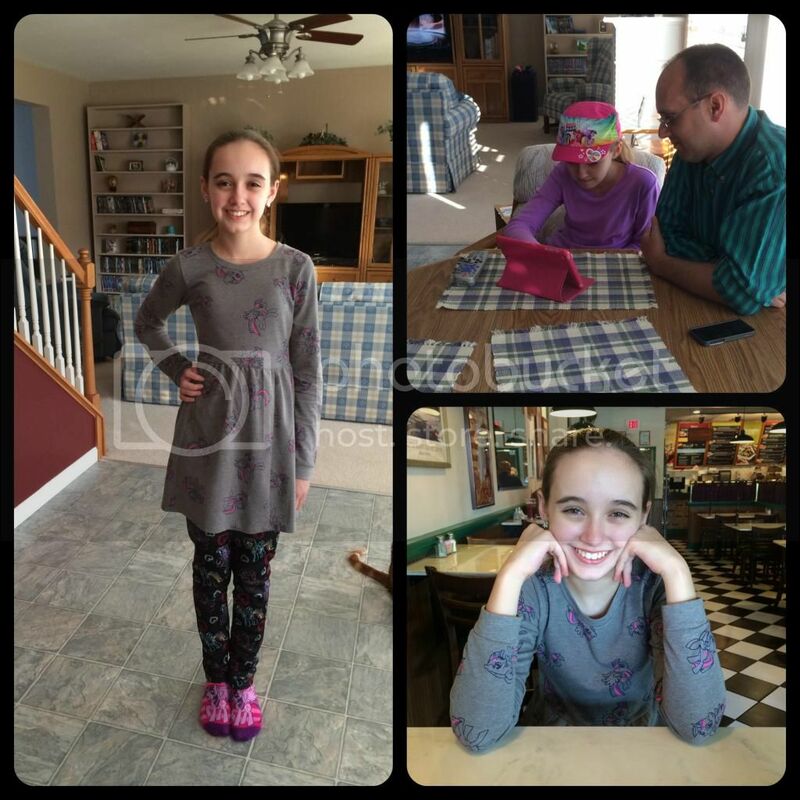 So Wednesday was a day off from formal school, but we learned a lot more about POTS during the testing. Amber did have confirmation class that evening too. She was exhausted, but made it through and passed her weekly test. Wouldn't you know that the assignment and memory work for this week are significantly easier. 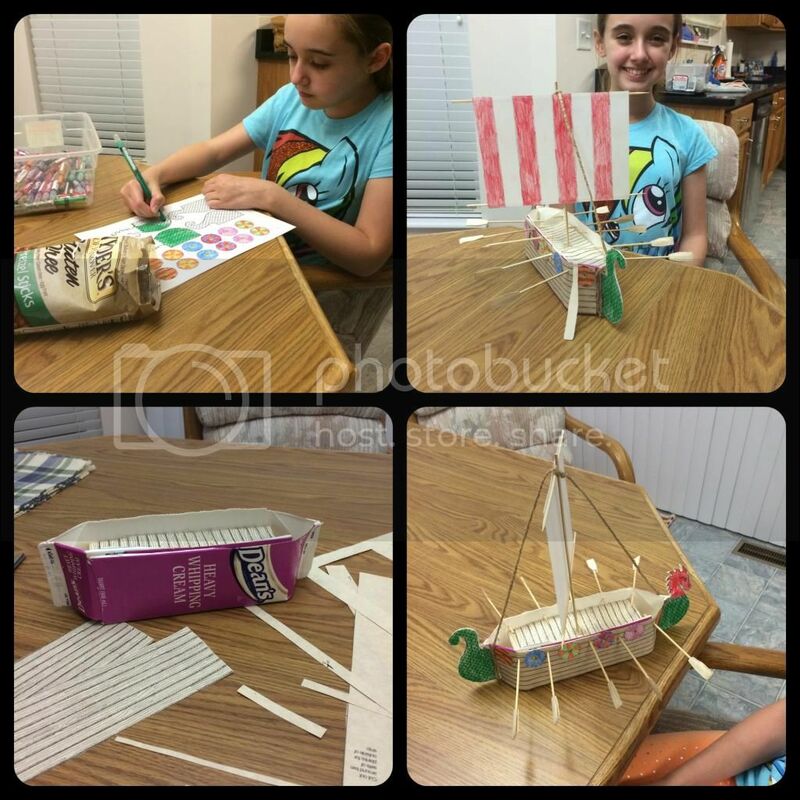 For our project learning this week, Amber worked on making a Viking longship. It was a fun evening project, because mornings have been pretty awful this week. Amber told me all about the different parts of the ships and how the Vikings used their longships to raid. She did also write a summary of the Viking religion, however that was an easy assignment since she is quite interested in Viking mythology. It was a well written piece and I can see how Writing With Skill, even though it is still unfinished, helped her writing. We are aiming to complete WWS, but in our own time. We probably will not go on to level two and instead use the writing aids from Tapestry of Grace. 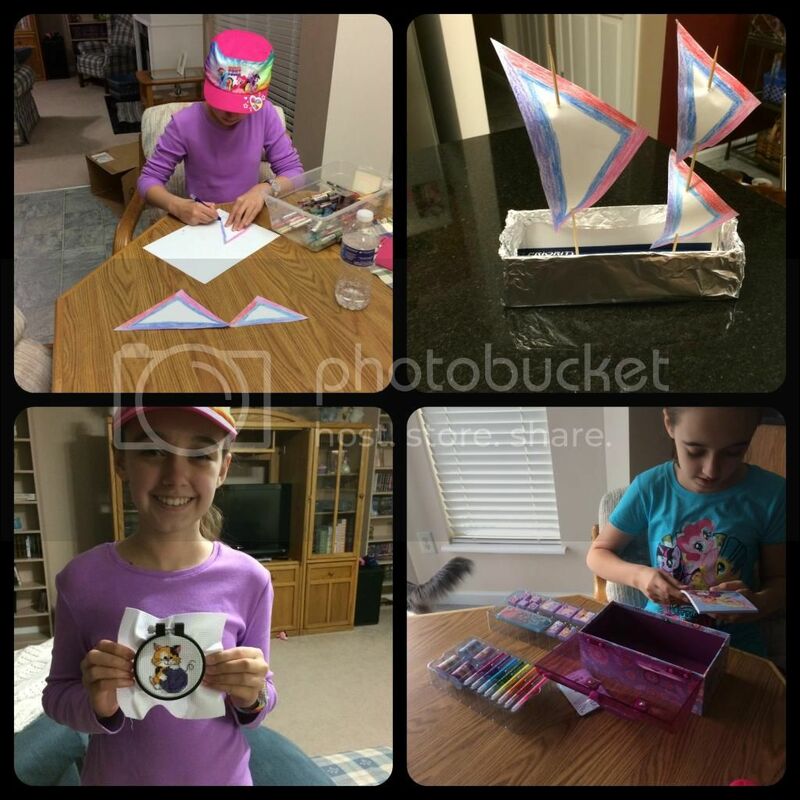 Working on her Viking Longship! Amber again helped with the project for my co-op 50 states class. I am using the same curriculum I used with Amber immediately after removing her from parochial school. Except we never did the projects at home. Now Amber gets to finally make the projects from her states study 3 years ago. This week it was a skipjack boat. Amber had no idea what it was so she got a quick lesson before creating my sample. There has been lots of cross stitch projects this week too. Amber finished her first one and started another, while I finished a small bead cat project and started a bead Christmas angel. I'm still ecstatic that Amber is enjoying needlework more. (BOTTOM-RIGHT) Surveying the goodies in the Frozen art kit. She did play around with it Wednesday afternoon. Fred and Amber have been playing a lot of Star Wars: Commander on the iPads and iPhones. This is a new addiction for Amber, but Fred had already been playing the very similar Clash of Clans. It was sweet to listen to him explain tactics to Amber and help her make good decisions in designating her base. She loves to attack other players, and has only lost twice! It's humorous to watch her antics during an attack. She gets a little nervous. CNN student news is still a favorite of Amber's and she has even started watching it on my iPhone on the days when we are not home a lot. She finds the host humorous and enjoys being a big kid learning about world events. On tap this weekend is more outside maintenance, baking / freezer cooking for Amber, and sorting the remainder of Amber's clothes. She outgrew almost everything we've tried so far. It means a bigger clothing bill than last year, but that's okay because she grew! And if you were keeping count... that was 3 MLP shirts, 2 pairs of MLP pants (admittedly I cropped the pics and you can't see the one pair, but hat day went with the other MLP pants), 3 pairs of MLP socks (because if you wear the shirt you gotta wear the socks), 1 MLP hat, and 1 MLP watch. I think that's it. Oh.. and the 4th shirt today that's not in any of the pictures. Sigh. We love CNN Student News! Fridays are Awesome!!! My kids don't miss it, even though they are only 9 and 10. Philip got into Vikings last year and over the summer thanks for 'How to Train Your Dragon'. He did a lot of research on his own. This summer while visiting my mother they want to a museum that had a display and Imax film on the Vikings. Philip bought the DVD, Vikings: Journey to New Worlds, as his souvenir. The Viking ship is awesome! What a great project. We love CNN student news too. I think the host is somehow related to homegrown learners. I remember her mentioning it once. I can't remember how. I am glad that Amber got through all of the tests. What a challenging medical week. For all that she goes through medically, she seems to accomplish quite a bit (even if it's not book work) and is smiling! Go, Amber! WOW! What great work and what a wonderful week! You guys accomplished a heck of a lot this week despite medical procedures and not feeling up to par! It must be such a relief to have the tilt test behind you, though I'm sure the results were disappointing. Jeremiah loves playing games like that with his dad and older brothers. Rebekah is 18 and still loves Hello Kitty! She was devastated when the terrible news came out that she is not really a cat but a girl who looks like a cat!